Does Whiskey Affect Your Cholesterol? Drinking modest amounts of alcohol may improve your cardiovascular health, although research about this isn’t strong enough to recommend drinking alcohol for this purpose. Whiskey and all types of alcohol can increase your triglycerides, a type of fat that counts toward your total cholesterol levels. Triglycerides are chemically different from low-density lipoprotein cholesterol, a waxy substance, but high levels of either put you at risk for heart attacks and strokes. If you drink whiskey, limit your consumption to two servings a day if you’re a man younger than 50. Everyone else should drink no more than one alcoholic beverage a day. A serving of whiskey, gin, vodka or rum equals 1½ oz. of 80-proof liquor or 1 oz. of 100-proof liquor. A serving of wine equals 4 oz. and a serving of beer equals 12 oz. Higher rates of alcohol consumption can raise your triglycerides, according to the American Heart Association (AHA). The AHA recommendations, released in April 2011, are based on more than 500 international studies about the effects of alcohol, including whiskey, on triglycerides. In addition to limiting alcohol in your diet, reduce saturated fat, trans fat and sugar in your diet. The AHA says that triglycerides prove very responsive to changes in your diet – no matter what you eat or drink now, you can reduce your triglycerides by 20 percent if you make improvements in your diet and another 20 to 30 percent if you exercise moderately at least 150 minutes a week. You may, however, find it harder to reduce your LDL cholesterol through diet and exercise, according to the AHA. An older study about whiskey consumption and triglycerides illustrates the point that changing your drinking habits can change your triglyceride levels. A man who drank about 6 oz. – 180 mL – of whiskey daily for 17 years had triglyceride levels of 5,120 mg/dL – 34 times the recommended upper limit of 150 mg/dL – milligrams per deciliter of blood. After abstaining from alcohol, his triglyceride levels returned to normal, according to the report in the June 1993 issue of “Internal Medicine." Y. Hiasa, a researcher at Ehime University School of Medicine in Japan, led the study. 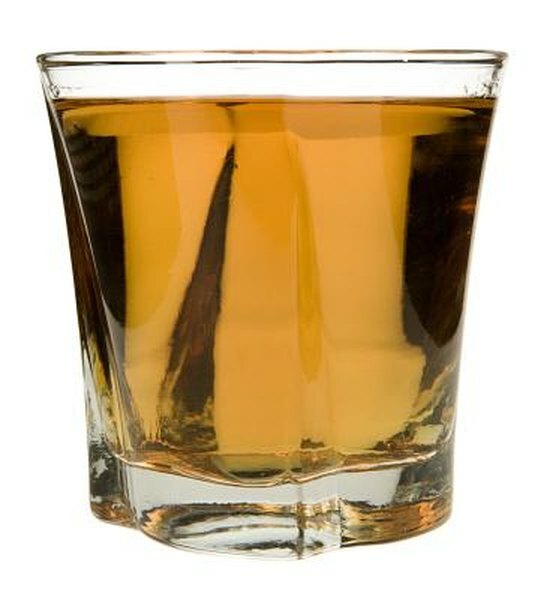 Whiskey and beverages mixed with whiskey -- sour mix and ginger ale, for example -- provide empty calories, meaning they provide little or no nutrition. Consuming empty calories can easily lead to weight gain, which could elevate your LDL cholesterol and triglycerides as well as decrease your heart-friendly high-density lipoprotein cholesterol -- HDL or "good' cholesterol. A drink that includes 1½ oz. of whiskey and 3 oz. of whiskey sour mix contains 181 calories.